Two words for you...GIFT STICKERS! If you are a sticker person like me, this might just be your favorite giveaway of the three. We're giving away a set of 30 Hicks Paper Goods personalized stickers (a $40 retail value) to one lucky reader. Get ready to adorn your holiday (or everyday) packaging! View the full sticker collection right here. Just tell us what your favorite gift is to give or receive during the holidays! I love to give away someone's favorite item to them...does that make sense? I have a friend that loves to cook, so I pick out a speicalty item (and oil or vinegar or chcolate or utensil) I know they want/like/would like. I love to give homemade goodies- usually from old family recipes and then dress them up really cute! These stickers would be a perfect finishing touch! I love baking up goodies as gifts and I love wrapping the goodies too. These stickers would be perfect as the finishing touch. Love the holidays! I love giving a gift card - this took me some getting used to, but I LOVE getting a gift card to my favorite places so I've started giving them more often. I try to make sure it is to somewhere specific to the recipients hobbies or tastes and wrap it up with homemade chocolate covered pretzel sticks and lots of ribbon. For christmas I love to ake things for people whether it be cookies or cakes or cupcakes I just love to give people stuff I have made and I know they will enjoy. My favorite thing to give OR get is something handmade (last year I got a quilt! lucky me!). Okay, or something sweet to eat. Either way. My favorite gift to give to our family members are photos of my kids! They always love them. I love giving someone a homemade ornament. It warms my heart to craft something special to pass out to those I'm fond of. Last year I started a tradition of making ornaments for my kids individual trees, they lite up when they saw all the love that went into it. I hope that's how everyone who receives a handmade ornament by me feels. My mom always gets me a gift card to get new clothes, which it seems like I'm always in dire need of by the time Christmas rolls around. Its kind of boring but I love to get clothes. I like to give items that someone may not buy for themselves, such as flowers, a cozy blanket, etc. I love to get my handmade gift from my Mother. If I got nothing else but this, I'd still be thrilled. I love to get a stocking full of little things~esp chocolate! I love to show how grateful I am to my family by making them homemade gifts. It means so much more to them than anything, and I love seeing their smiles when the open them. Now this year is extra special because I have my little boy and husband to share this with and now I can find even more create ways to show my appreciation and craft! And each year giving a toy for the children who don't get anything. Anything to give back to the community. I love to give small things that people don't expect. Last year my daughter and I made all of her friends small warming pillows for all of her friends in her day care class. She loved delivering them and they all loved their warmies! i like to give gifts that keep going through the year (i.e. i made my own book of the month club for my nieces where i gave them a gift card to the bookstore for each month of the year). i love receiving homemade/handmade goodies! I just love to give homemade jars of cookies, all presented beautifully! Jewelry. I love to receive it and give it. I love giving something useful that the recipient would never buy themselves--or something they can't find. I love getting good chocolate and tabletop/kitchen stuff. I love giving pajamas to my Mom. We do this every Christmas Eve and it's fun to pick out something cute and snuggly for her! OH MY MY MY!! Bird on a Snowy branch! Who could ask for a more perfect sticker...a bird and one of my favorite color combinations!! Thanks again for such a generous giveaway! i am giving out homemade vanilla extract this year, which i'm really excited about!! I love to give anything homemade! I love even more to get something that was homemade!! It means so much more that way! I love to give personalized gifts and even homemade goodies. I appear to be a sucker for your giveaways today. I think my favorite gift to give is anything personal and/or hand made. It seems like anyone can go pick out some generic gift from a store, but taking the time to make something for a family member or friend, such as an ornament, hand-knit scarf, baking kits, etc, can be so much more thoughtful. As for me, my favorite gift to receive is really just to have family with me on that special day. With a family of my own now, it makes me so much happier to see my little girls open gifts than it does for me to open them. Then again, I do love a great fashion accessory too! I love shopping for my kids and nieces and nephews. I love seeing their face light up when they see something they wanted. I also give out personalized gifts. I don't really care if I get gifts, but I love giving gifts...especially to my loved ones! favorite gift to receive is usually something handmade. it shows that the giver took time and thought into their gift, and that means more than anything! thanks! i love to give my daughter a toy I know she'll love! This is my fave of the three! I love getting books during the holidays because that's the time I actually have to sit a be cozy and read. My favourite gift to both give and receive are books. I love to find books that represent some type of special bond between me and the giftee. For example, I gave A Year of Mornings to a friend living 4001 miles away with whom I share weekly photos with our emails. I'm fond of giving giant matches in patterned boxes -- something practical and suitable for display. I like wrapping process best. But giftwise? A bottle of vino is perfect any time! I usually give wine for adults, but my favorite gift this year are the ISeeMe books for all my neices and nephews! I love giving (and getting) homemade gifts! For the past few years, I've given friends and teachers hand-made letterpressed calendars off Etsy. They are always a huge hit! My favorite item to give during the holiday season is not one paticular item, but something I have found(not on one's list) that is perfect for the person. Baking too, of course. My favorite gifts to give are anonymous ones to those in need. Something we always did as a family growing up, and now that we have a kiddo of our own I want to continue that tradition in our own family. 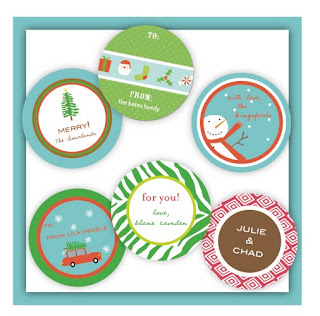 oh my goodness, i've been coveting some fun round stickers for awhile now! i LOVE the stitch red round ones!!! Lovely!! The Diamond Green sticker matches my gift wrap perfectly. My gift wrap matches my tree, so you can see how perfect these stickers would be!! I love giving homemade gifts and baked items. i love to bake yummy treats and give them away to family, friends, and neighbors. (and a few for us, of course!) hope to win! Hands down, anything hand (or home) made. I consider it an "investment" of sorts, in the people we share our lives with. My favorite gifts to give are books, for children I try to find old ones that fit their personalities. Lately along with a book, I have been making giant pillows for the children to lay on while reading/looking at the books. I love to giving beautiful framed photos to people as gifts. I love stickers too. My favorite gift to give is a magazine subscription, expensive soaps, or homemade jam, granola or pickled beets. My favorite gifts to give and get are handmade, or donations made in someone's honor. My favorite gifts to give and receive are ones that you can tell have been thought about not just picked up at the last minute. I love giving copies of Charles' Dickens "A Christmas Carol" or packages of high quality cocoa. I love hand made things. Both getting and giving htem. My favorites include a quilt my mom made me and a book my sister made with pictures of my nephew. I love giving gifts that people need. My mom was in need of a new winter coat so she was super happy to receive a nice coat for Christmas, plus I get joy knowing that she'll use it. I love receiving anything handmade. It just touches me to know that someone spent their own energy and time on something and gave it to me. I love giving handmade things (though my craft is heavily centered on food). And I love giving people things that that they would love to have but would never buy for themselves. My favorite gift to give is chocolate. Dark chocolate! Who doesn't love that!? I love sending boxes of goodies to friends with little kids who may not have time to bake the more elaborate Christmas cookies/treats. They love it, their friends love it, and it's always a surprise to get anything fun in the mail!! These stickers would definitely help me out when sending these great packages! My favorite gift to receive is anything that comes beautifully wrapped. There's something about gorgeous wrapping that makes me so happy! I love receiving useful gifts. I know that may sound boring to most, but I am such a sucker for pretty practical things. i love to give presents to my nieces and nephews! it's so fun to see the joy in their eyes when they open their gift! I love to bake some yummy treats for my friends. I travel a lot and so do my friends so I love to give Restaurant Guides to cities that they frequent often for work! Perfect gift to get is something personal from friends and family...I love something homemade..I love to bake and MAKE my gifts. I love getting and giving anything monogrammed! It shows that you were thoughtful enough to plan ahead! I love to make and give homemade marshmallows. Trust me, you'll never want store-bought ones again! I love and receive to give a happy experience - a moment shared with someone is one thing that is uniquely theirs, especially these days when personal time with a person can be so hard to set aside :) Another good thing about experiences is that they can be relived in your mind countless times and each time you would still feel the love and joy. What beautiful stickers. Love them! My favorite gift to receive is anything girly. I love giving and receiving books. I'm an avid reader and I'm always eager to share books I love and to receive books my friends love. The best gift (whether given or received) is one that's a surprise and still perfect. It's no fun knowing what's under the tree because you bought! love the candy cane stripe! Not that pink and red are the only great combos. I love to make something for someone that i know they really want but couldn't buy. I love to give and get Homemade goodie baskets!!!! I'm always scrounging for gift tags at the last minute. These pretty stickers are the perfect solution. Books! I love to select the perfect book for friends and family. These are great! I love stickers, I love the merry snowman ones, they are too cute! How fun! I love to give each friend a perfect pair of earrings. So much fun! I hope I win! These stickers are adorable! I love giving pretty little presents that someone would love, but wouldn't want to spend the money on. I love giving gift certificates for things we can do together...like a day of wine tasting at a local winery or lift tickets for a day of skiing. There's nothing better than the gift of time with your loved ones! Homemade steamed Christmas puddings! We set aside a day to make as many as we can get on the gas burners and then wrap them up all pretty ready for delivery to our special pudding lovers. Thankyou so much. Pick me! It's a tough pick but I like the bird on the snowie branch. C-U-T-E. These will make wrapping gifts a real treat! My favorite gift to give is some kind of food item. This year it's likely lemon curd and scones. Hard to resist. this year i'm hoping to get a new camera to take pictures of my baby who is arriving march 4th! My favorite gift to receive is always the least practical & beautiful. Last year, the Hub gave me a beautiful necklace of glass blown beads that look like bubbles from Anthropologie. My favorite gift to give is something the person would never buy for themselves - and that varies by person. The best gift is one that a person will treasure. Sometimes the smallest gifts have the biggest impact on a person heart. Those are my favorite gifts to give! I love to give cookies or something sweet over Christmas time. Last year I made fudge, chocolate pretzels, and some sugar decorated cookies. I love to get handmade gifts, they are the best because they are unique. I LOVE stickers!!! I would love to add some news one to my collection. :) I love to give children's books and love to recieve anything from kate spade. My most treasured and favorite gifts are handmade. I don't remember a lot of toys and gifts I received as a child-they are fun and exciting for a time and then you forget about them. But I will never forget the dolls or dresses that my grandmothers made for me. i love to give a memory on paper! I love to give and receive socks~ I prefer stripes, but always colorful and cozy! i love to give baskets of homemade cookies to friends! I love doing it, baking is a passion! I love to bake, so I love to make chocolate goodies and cinnamon bread for friends, family and neighbors! I make homemade marshmallows and hot cocoa mix for coworkers; easy and always a hit. i love these! i love giving homemade baking items, either recipe books or dishtowels/hotpads, etc. My favorite gift to give is an ersatz advent calendar for the whole year. Just put a special, funny or uplifting thought on a small card and seal it in a corresponding envelope--one for each month, week, whatever! Then put them all in a pretty box and tell your recipient to enjoy all year! My favorite gift to give is something handmade or the latest picture of my family in a pretty frame. Thanks for the great giveaway! Hugs! !